Or it will be at 11 am tomorrow morning! The weather might be cool, but the chairs are out, the lifeguards are ready, and the pool is clean and clear. We're ready to get this summer started. Before you hop in, you might want to re-familiarize yourself with the pool rules. Otherwise, bring your sunblock (and maybe a sweater) and we'll see you tomorrow! 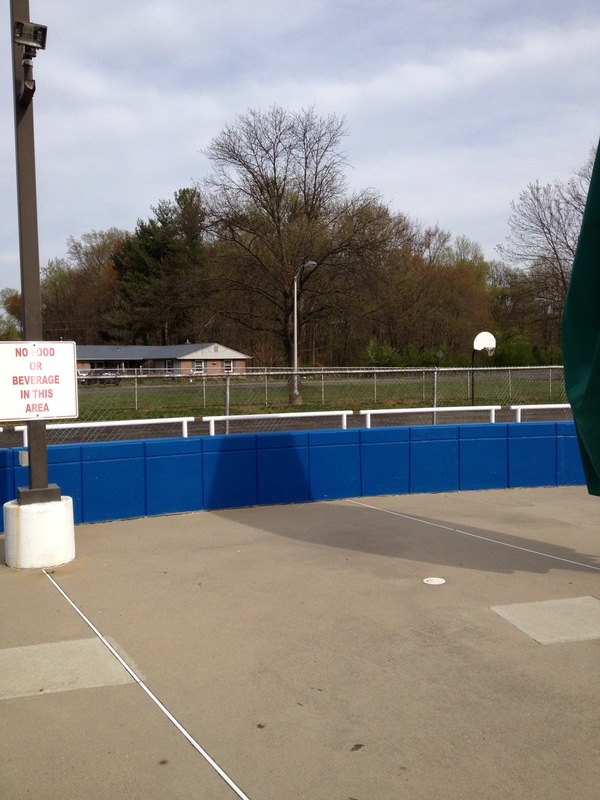 And many thanks to our many volunteers who helped our staff get the pool ready for opening weekend! Makin' Progress! We ❤ our Volunteers! April 15, 2013 by Peter Harsha in To-do! We're now two weekends down in our eight week Greenbriar Pool pre-opening work schedule and pleased to report some great progress (and great weather!)! Our awesome volunteers have helped clean and prep both the dumpster enclosure and the mural wall and given them new coats of paint. The dumpster enclosure took a lot of power washing to clean up, but fortunately there were a lot of bodies willing to take a shift or two to get it done. Thanks especially to Dan M., Michelle L., Loriann G., and Doug H. for spending the bulk of the time cutting through the grease, grime and mold on the wall and prepping the surface for its new paint. Thanks also to Dan M., Karen M., Brandy J., Jim J., and Gene N., for helping prep and clean the rail on the mural wall for new paint, Karen M., Dan M., Theo H., and Doug H., for cleaning the mural wall, and Patti P., Kevin P., Alex P., Deb C., Gary Y, Mary O., for handling the first coat of primer and paint. 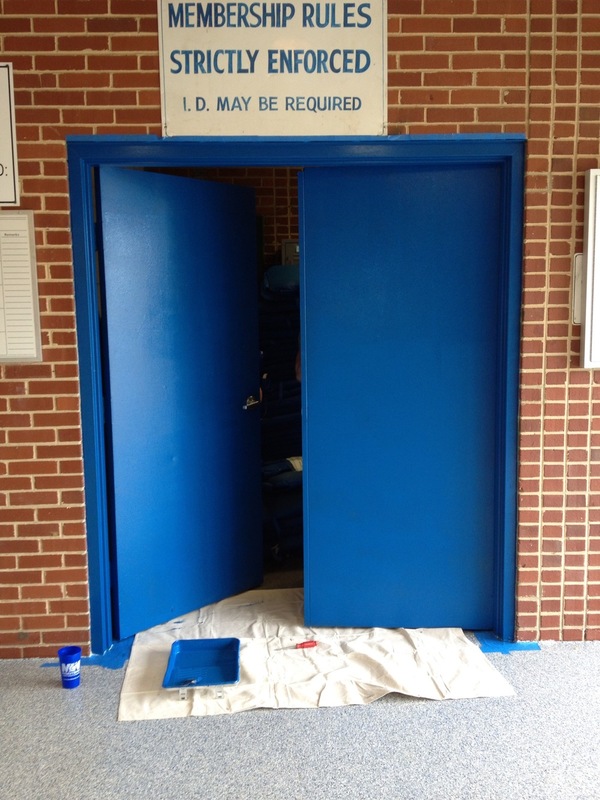 Michelle L., Nick J., Brandy J., Jim J., Karen M., and Gary Y., all helped get the locker room doors prepped for their new paint, too. While there's lots of measurable progress, there's more yet to be done. You can keep track of all the tasks yet to complete on our Volunteer Opportunities page, and better yet, sign up and offer to take care of a few yourself! In the coming days we'll finish priming and painting all the various doors around the facility -- the locker room doors, the doors to electrical cabinet and storage closet, the doors to the snack bar. 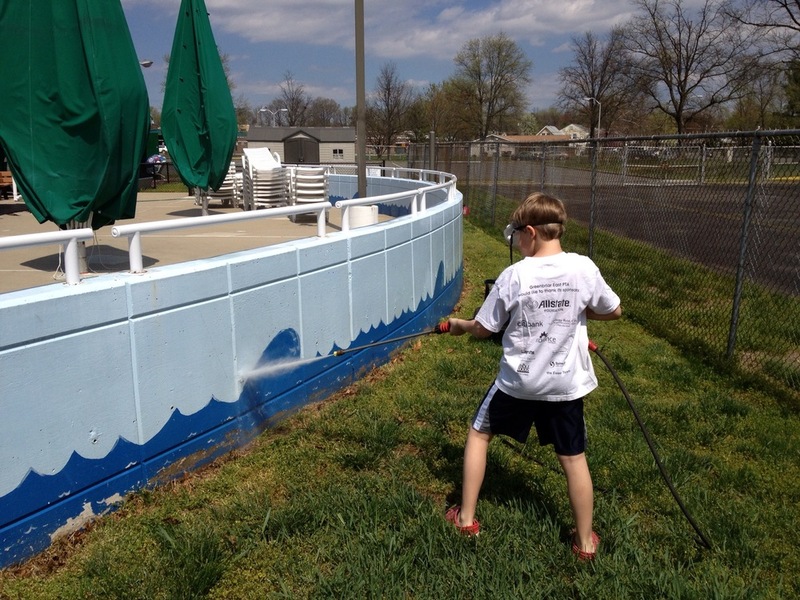 In addition, on Monday, April 15th, at 6 pm at the pool, we'll have the first meeting of the Greenbriar Pool Beautification Committee. It's not too late to be a part of it! Come on out and help the club manage its landscaping needs and keep its planting beds clean and thriving. Your pool needs you!